While you may only be implementing a few chargers for your initial pilot, it’s smart to plan for future growth. 3. WHAT IS BUS RATE OF CHARGE (kW)? 4. WHAT IS ALLOTTED TIME IN WHICH BUSES HAVE TO RECHARGE? 7. THINK AHEAD While you may only be implementing a few chargers for your initial pilot, Tillman says it’s smart to plan for future growth. “The utility probably won’t give you a transformer for 100 buses if you’re only taking delivery of 10. But, there are certain things you can do like sizing the transformer, PME (Pad Mounted Equipment) switch, and capacitor pads appropriately for future upgrades and installing extra conduit so that when you do take delivery of those next 90-plus buses, you’re already ahead of the curve,” he says. 8. 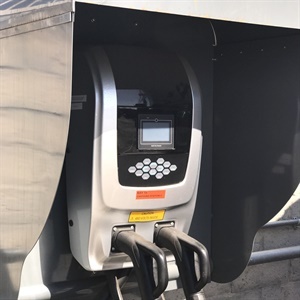 CONSIDER “HYBRID” APPROACH As charging infrastructure continues to mature, implementing a hybrid approach that includes both depot and on-route chargers may be the best path to choose. “If you do go with a hybrid approach there are some creative solutions you can do with hub charging. For instance, you won’t always need to fill your buses to 100-percent capacity, but that analysis really comes with more mature battery-electric bus deployment,” he explains. “If you have several routes that come in and out of a major bus hub and you are able to install an overhead bus charging station there, as well as some other locations along your routes, it would reduce the amount of charging at the bus depot, the number of depot charging stations, and your overall demand charges. 9. USE A CONSULTANT A consulting firm can help transit agencies determine what charging options are best for their needs before adding electric buses to their fleet. In addition to the considerations mentioned, a strong consulting firm can also factor in operational procedures of the barn, future expansion needs, and integration of ultra-high powered in-route charging, amongst other unique circumstances of the agency.